So, is everything rosy in the Project Server / TFS integration world? Well, yes and no. Yes in terms of once everything is set up, it works very well (it does what it says on the tin!). 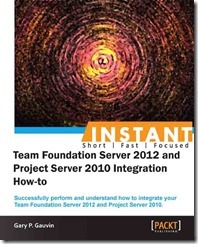 No, in terms that setting it up can be fairly complex, which is where the following paper comes into play “Instant Team Foundation Server 2012 and Project Server 2010 Integration How-to” which is available at http://bit.ly/ZulWBG. I’ve read the paper it and it explains exactly what you need to set up and configure in order to get the two solutions (TFS and Project Server) to talk to each other, and it includes a whole section on getting the security right, and all the powershell commands required in order to associate a Project Server plan with a TFS project. I you are planning to deploy TFS/PS integration, then I would recommend this as a good technical starting point.